I have not written about Brazilian oil giant Petrobras (PBR) because frankly the stock has been a quite poor performer due to its pseudo government-private stature. Sort of the Fannie Mae of oil production. With the recent spike in oil, the stock has perked up, but some horrid terms on a share sale put immense pressure on the name through most of 2010. This would be a "no brainer" company to invest in for the next few decades if not for the heavy handed government involvement - much like Saudi Aramco, this company is in part run for the benefit of the Brazilian people rather than directly for shareholders. I am not saying that is wrong or right but as a shareholder one must have that point in mind. Fortune magazine has an excellent story on the company, and its destiny to pass ExxonMobil as a global powerhouse, for those interested - some blurbs below. P-52 is one of the largest and most advanced oil-producing structures ever built. 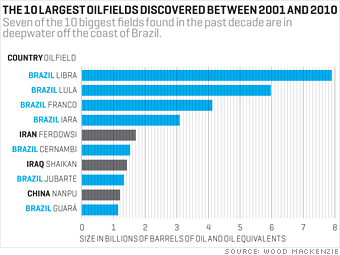 It belongs to Petróleo Brasileiro, or Petrobras, the government-controlled but publicly traded Brazilian oil giant. Finished in 2007 at a cost of more than $1 billion, P-52 has a main deck bigger than two football fields, and its displacement of 81,000 metric tons is greater than that of the Queen Mary 2. Since BP's (BP) disastrous Deepwater Horizon accident in the Gulf of Mexico last April, the risks of offshore oil drilling have been a hot topic. One place it isn't questioned much is Brazil, whose oil production industry is one of the fastest-growing in the world because of vast new deepwater oil reservoirs discovered in the past five years. The largest finds are in the Santos Basin, which, at nearly 200 miles off the coast of Rio, is much farther offshore than even Campos. The mega-fields there lie more than three miles below the ocean's surface, underneath a salt layer in the crust of the earth some 6,000 feet thick. The technical and logistical challenges of drilling in these areas are immense. Together, the so-called pre-salt reserves off the coast of Brazil have been put at 50 billion to 100 billion barrels or more -- potentially a deepwater Kuwait. Vast amounts of money and manpower are being mobilized for what is shaping up to be a historic investment boom. Foreign oil-services companies like Schlumberger, (SLB) Halliburton, (HAL) and GE (GE) are rushing to set up offices. It has been estimated that offshore oil and gas could be as much as a $1 trillion industry for Brazil over the next decade. The company spearheading all this activity is Petrobras (PBR). By every measure the energy giant is already one of the world's most important corporations -- and it stands to grow vastly more influential. Last year Brazil's biggest corporation ranked No. 54 on Fortune's Global 500 list of the world's largest companies; in its most recent fiscal year revenues jumped 32% to $121 billion. 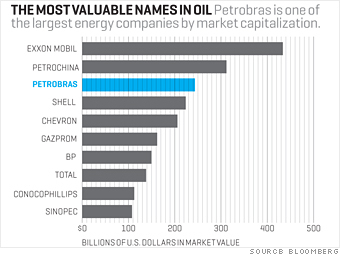 Excluding wholly state-owned oil companies such as Saudi Aramco or NIOC of Iran, Petrobras is the fifth-largest oil company by production (2.15 million barrels a day in 2010) and the third-largest in market capitalization ($240 billion). By the end of the decade, Petrobras is likely to pass Exxon Mobil (XOM) to become the largest publicly traded oil company in reserves and production. Developing the pre-salt assets is a daunting task. For starters, it will be mind-bogglingly expensive. 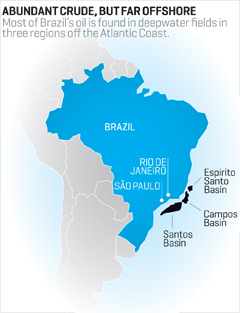 In its five-year plan through 2014, Petrobras has committed to invest $224 billion, much of it on platforms, rigs, and other infrastructure for pre-salt production. (It's also building five new refineries.) To help fund the effort, last year the company conducted the largest share offering in world history when it sold $70 billion worth of new stock to investors. It plans to sell up to $40 billion in bonds by 2014. Petrobras has 14 ultra-deepwater drilling rigs -- far short of what it needs. By 2012 it will have added 20 rigs that are now either under construction or being used by other companies. After that there's no supply. The shipyards in Singapore and South Korea that build most of the world's offshore drilling devices are maxed out. So Petrobras is helping create a rig-building industry at home. It is awarding contracts worth a total of about $18 billion to four Brazilian shipyards to supply 28 rigs starting in 2014. For all the excitement about the growth in Brazilian oil, investors haven't been all that pleased with Petrobras lately. In 2010 the stock dropped 27% even as the overall Brazilian market was flat. The catalyst was dissatisfaction with the company's stock sale last summer. Regular shareholders had their holdings diluted by the $70 billion stock sale while the government's total stake in the company rose from 40% to 48%. (It holds 54% of the voting shares.) Petrobras handed over $42.5 billion of the $70 billion it raised to the government for the right to produce 5 billion barrels of pre-salt oil in areas not previously awarded to the company. Famed emerging-markets investor Mark Mobius of Franklin Templeton called the transaction an "abomination."